IPL 2018, Match 54, Turning Point – Where did it go wrong for SRH against KKR? 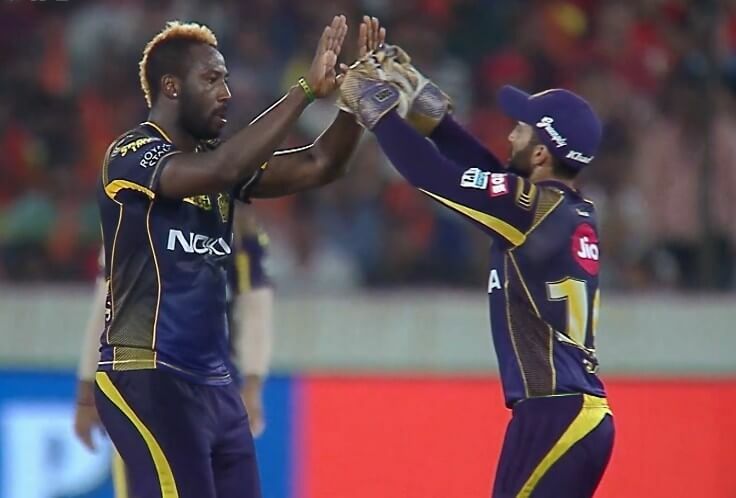 Another crucial game of the IPL 2018 saw Kolkata Knight Riders visiting Sunrisers Hyderabad at the Rajiv Gandhi International Stadium for the 54th match. SRH had already secured a spot in the top 2 but KKR needed a win to consolidate their playoff slot. The visitors defeated a strong side to reach 16 points which guarantee a place in the playoffs. Kane Williamson won the toss and decided to make first use of the pitch by batting first. SRH sent Shreevats Goswami to open the innings alongside Shikhar Dhawan, a move that yielded great results. The 2 left-handers took the KKR bowlers to the cleaners and made full use of the fielding restrictions. After the end of the fielding restrictions, they had powered their way to 60 without loss. Both of them were matching each other shot for shot and also went side by side in terms of individual scores. The duo added 79 runs for the first wicket before Kuldeep Yadav brought the first breakthrough when he removed Goswami for 35. The skipper Williamson came out to bat and he wasted no time in carrying on with his magnificent form this season. He went absolutely hammer and tongs from ball one and upped the ante. After 12 overs, SRH reached 110/1 and with 9 wickets in hand, looked like cruising towards 200. The 13th over of the innings was bowled by Javon Searles and Williamson took a liking for him. He struck the bowler for 2 consecutive sixes with the utmost ease. He was in no mood to stop just yet and tried to hammer the 3rd six of the over. But a slightly shortish delivery outside off was cut straight into the hands of Andre Russell in the deep. Unfortunately, Williamson, who had promised a lot with his wonderful stroke-making, had to walk back after scoring 36 off 17 balls. In the context of the game, it was a major blow that KKR delivered at the crucial stage. The scoring took a halt after that and Dhawan, after reaching a fifty, also departed in the 16th over. The death overs witnessed a flurry of wickets as KKR pulled things back big time. Prasidh Krishna bowled a magnificent spell and claimed 3 wickets in the last over and overall, finished with 4 wickets in the bag. SRH were restricted to 172/9 after 20 overs and given the kind of start they had gotten, fell short by at least 20 runs. KKR’s chase began with a flourish as Chris Lynn and Sunil Narine showed no mercy to the bowlers from the outset. There were explosions from either end as the score was boosted to 41 after 3 overs. Shakib Al Hasan then accounted for the wicket of Narine who scored 29 from 10 balls. But Robin Uthappa and Lynn carried the momentum as the powerplay yielded 66 runs. Uthappa took his time in the beginning while Lynn kept going from the other end. Even though there was a slight check on the scoring rate but the visitors were always in control of the required rate. Lynn reached his fifty and Uthappa too began to open his shoulders as just 54 runs were required from the last 7 overs with 9 wickets in hand. Siddharth Kaul then sent back Lynn for 55 in the 14th over. Dinesh Karthik walked in to bat while Uthappa cut loose at the other end. After scoring 45 from 34 balls, he fell prey to Carlos Brathwaite. Russell’s stay was shortlived as he was dismissed for 4 by Kaul. But with no pressure of the required run-rate, Karthik comfortably completed the formality as KKR sealed a playoff spot.